Give TDP all the credit...our facilities are a million times better than they were. I have been to many other programs around the country and there is no doubt that Clemson has one of the top 5 football environments and facilities in the country, period! 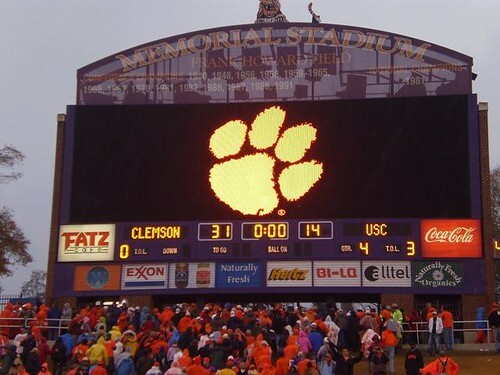 Even when the facilities were behind other programs 10 years ago, the environment is what continued to make Clemson's program so attractive...and that is one thing that will never go away! Now that Clemson has progressive, state of the art facitilies it will continue to attract top 10 recruiting classes most every year. You step onto the Clemson campus on any football Saturday and you immediately feel and see the raw, pure, traditional football environment that only few programs around the country actually have. It is totally something that has to do with the God made surroundings, fans and facilities. Clemson is at the top on God made surroundings....blue ridge mountains in view, lake next to the stadium, immediate landscape as plush as can be, no ugly distraction or interference from city sprawl, and a pure college campus that is envied by many college programs across the country!! The haters make try to make fun of the college town of Clemson understand that it is ONLY due to their own envy and jealousy, period!! I also love it when the haters say that Clemson is in the middle of nowhere not realizing that one of the top things that college students enjoy about going to college at Clemson is the immediate environment on the campus as well as the close proximity of Greenville and Atlanta. Clemson University and it's students have more support from those two progressive cities than any other programs in the southeast! Oh yeah, the haters love to hate in some of these internet threds but it's all to obvious that it is because they feel inferior to the PROGRAM that is Clemson University. Maybe with two boards, it will free up space for a larger display. Given the revenue generated from those ads...I doubt it. MSU I would be VERY impressed. For our size, we do a heck of a job already. no reason we can't compete and blow them out of the water. we could upgrade that board to HD and use the entire thing for the game/replays, and since we like to advertise so much, just add two little boards on the sides for the ads. I'll apologize in advance but I've missed something somewhere. I keep seeing references to the "OCULUS". What the h&(( is the "OCULUS"? Thank you for the image. Quite impressive. I am no longer in the dark. What I really like about the building is the name when I see it. all over it. Very impressive - thanks! WARNING: all material posted by kfast600 is not to be taken seriously and can make you dumber than you were before, if that is actually possible. FINALLY! A NEW sound system! Since I relocated to the sideline towards the west endzone you could never hear the PA announcer let alone the band playing running down the Hill. I'm all in on that idea finally! Re: FINALLY! A NEW sound system! Is Daktronics involved with the video and sound systems? I couldn't tell from TDP's comments. Re: Is Daktronics involved with the video and sound systems? Me too. Very informative interview. ACC schools for additional penalties to UNC.....huh? What a joke of an interview. But then again I guess if you asked anything other than softball questions you'd lose all of those "exclusive" interviews you get to do with players and coaches. You can either be journalists or publicists, and it's clear what you've chosen.